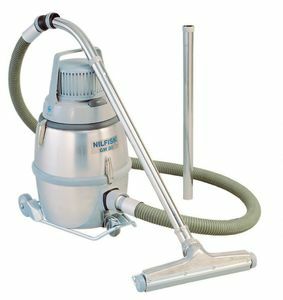 Nilfisk GM-80 HEPA-Filtered with Accessory Kit Nilfisk This lightweight vacuum cleaner has a 3.25-gallon tank capacity. It is interference suppressed for safe use around sensitive electronic equipment and includes a HEPA filter. An Accessory Kit is included with this vacuum. It includes: Detachable Trolley, 6'6" 32MM Plastic Hose, 2 Straight Steel Wands, Combination Floor Nozzle, Dust Brush, Crevice Nozzle, Upholstery Nozzle with Insert, 30' Power Cord and a package of 5 Paper Bags. Dimensions: 14" x 12" x 16"